The process, known as Grindadráp, or Grind, involves dozens of pilot whales and dolphins being driven into shallow waters by fishermen in boats and dinghies each year. From there, a group of people in the water and on the beach pull the mammals closer to shore, where they are killed by hand – a process which turns the waters into a sea of blood. The meat and blubber are then distributed to residents. The practice has long been criticized by activists, with People for the Ethical Treatment of Animals (PETA) saying it causes the mammals pain and fear. “Metal hooks are driven into the stranded mammals' blowholes before their spines are cut. The animals slowly bleed to death. Whole families are slaughtered, and some whales swim around in their family members’ blood for hours. Whales and dolphins are highly intelligent creatures and feel pain and fear every bit as much as we do,” PETA UK wrote on its website. Last month, Sea Shepherd Netherlands, a non-profit marine conservation organization, announced that it had officially submitted a request to the European Commission to launch “infringement proceedings” against Denmark, accusing the country’s officials of facilitating the slaughter. The activist group alleges that Danish officials, including police, navy, and customs officers have been “facilitating and even actively participating in the Grind,” which violates the EU’s Habitats Directive on the Conservation of Natural Habitats and of Wild Fauna and Flora. Last month, activists vandalized a famous statue in Copenhagen, in a move which called on Denmark to “defend the whales of the Faroe Islands.” Sea Shepherd denied taking part in the stunt. The Faroe Islands, an autonomous territory in the North Atlantic, is part of the Kingdom of Denmark. Although Denmark joined the European Union in 1973, the islands chose to remain outside the bloc – thus it is not directly subject to EU laws which prohibit the killing of whales and dolphins like Denmark is. The annual slaughter, which takes place between June and November each year, is believed to have begun around the time the Faroe Islands were settled more than 1,000 years ago. 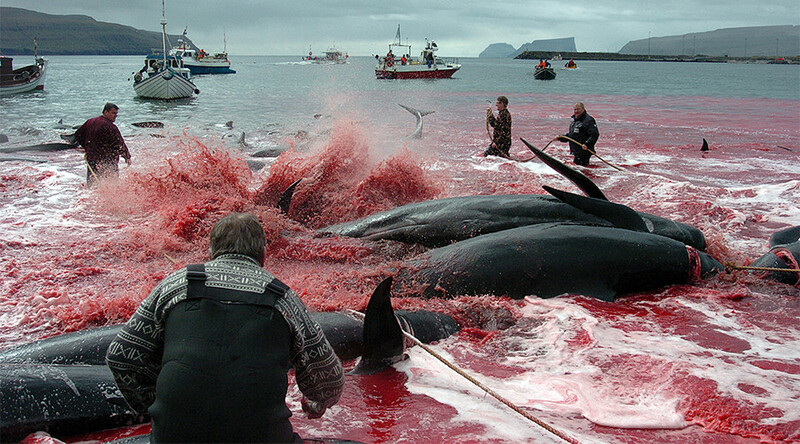 An average of 838 pilot whales and dolphins are killed by residents each year, according to a 2012 study.